John Thomas Sayles (born September 28, 1950) is an American independent film director, screenwriter, editor, actor and novelist. He has twice been nominated for the Academy Award for Best Original Screenplay, for Passion Fish (1992) and Lone Star (1996). His film Men with Guns (1997) was nominated for the Golden Globe for Best Foreign Language Film. His directorial debut, Return of the Secaucus 7 (1980), has been added to the National Film Registry. 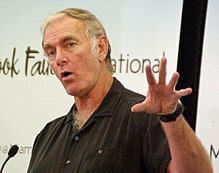 Sayles was born in Schenectady, New York, the son of Mary (née Rausch), a teacher, and Donald John Sayles, a school administrator. Both of Sayles's parents were of half-Irish descent and Catholic. He attended Williams College with frequent collaborators Gordon Clapp and David Strathairn. Like Martin Scorsese and James Cameron, Sayles began his career working with Roger Corman. In 1979, Sayles used $30,000 he earned writing scripts for Corman to fund his first film, Return of the Secaucus 7. To make the film on a limited budget, he set the film in a large house so that he did not have to travel to or get permits for different locations, set the story over a three-day weekend to limit costume changes, and wrote about people his age so he could cast his friends in it. The film received near-unanimous critical acclaim at the time and has held its reputation. In November 1997, the National Film Preservation Board announced that Return of the Secaucus 7 would be one of the 25 films selected that year for preservation in the National Film Registry at the Library of Congress. In 1983, after the films Baby It's You (starring Rosanna Arquette) and Lianna (a story in which a married woman becomes discontented with her marriage and falls in love with another woman), Sayles received a MacArthur Fellowship. He put the money into the fantasy The Brother from Another Planet, a film about a black, three-toed slave who escapes from another planet and after crash-landing on Earth, finds himself at home among the people of Harlem, being pursued by white male agents from his home planet dressed as men in black. In 1989, Sayles created and wrote the pilot episode for the short-lived television show Shannon's Deal about a down-and-out Philadelphia lawyer played by Jamey Sheridan. Sayles received a 1990 Edgar Award for his teleplay for the pilot. The show ran for 16 episodes before being cancelled in 1991. Sayles has funded most of his films by writing genre scripts, such as Piranha, Alligator, The Howling and The Challenge. Having collaborated with Joe Dante on Piranha and The Howling, Sayles acted in Dante's movie, Matinee. In deciding whether to take a job, Sayles reports that he is interested mostly in whether there is the germ of an idea for a movie which he would want to watch. Sayles gets the rest of his funding by working as a script doctor; he did rewrites for Apollo 13 and Mimic. A genre script, called Night Skies, inspired what would eventually become the film E.T. the Extra-Terrestrial. That film's director, Steven Spielberg, later commissioned Sayles to write a script (unused) for the fourth Jurassic Park film. He has written and directed his own films, including Lone Star, Passion Fish, Eight Men Out, The Secret of Roan Inish, and Matewan. He serves on the advisory board for the Austin Film Society. Maggie Renzi has been John Sayles' long-time companion (and collaborator), but they have not married. Renzi has produced most of his films since Lianna. They met as students at Williams College. Sayles works with a regular repertory of actors, most notably Chris Cooper, David Strathairn, and Gordon Clapp, each of whom has appeared in at least four of his films. In early 2003, Sayles signed the Not In Our Name "Statement of Conscience" (along with Noam Chomsky, Steve Earle, Brian Eno, Jesse Jackson, Viggo Mortensen, Bonnie Raitt, Oliver Stone, Marisa Tomei, Susan Sarandon and others) which opposed the invasion of Iraq. In February 2009, Sayles was reported to be writing an HBO series based on the early life of Anthony Kiedis of the Red Hot Chili Peppers. The drama, tentatively titled Scar Tissue, centers on Kiedis's early years living in West Hollywood with his father. At that time, Kiedis's father, known as Spider, sold drugs (according to legend, his clients included The Who and Led Zeppelin) and mingled with rock stars on the Sunset Strip, all while aspiring to get into show business. In February 2010, Sayles began shooting his 17th feature film, the historical war drama Amigo, in the Philippines. The film is a fictional account of events during the Philippine–American War, with a cast that includes Joel Torre, Chris Cooper, and Garret Dillahunt. His novel A Moment in the Sun, set during the same period as Amigo, in the Philippines, Cuba, and the US, was released in 2011 by McSweeney's. It includes an account of the Wilmington Insurrection of 1898 in North Carolina, the only coup d'état in United States history in which a duly elected government was overthrown. In June 2014 Sayles donated his film archive to the University of Michigan. It will be accessible at the Harlan Hatcher Graduate Library. Bruce Springsteen – "Born in the U.S.A."
Bruce Springsteen – "I'm on Fire"
Bruce Springsteen – "Glory Days"
Sayles' first published story, "I-80 Nebraska", won an O. Henry Award; his novel, Union Dues, was nominated for a National Book Award as well as the National Book Critics Circle Award. In 1983, Sayles received the John D. MacArthur Award, given to 20 Americans in diverse fields each year for their innovative work. He has also been the recipient of the Eugene V. Debs Award, the John Steinbeck Award and the John Cassavetes Award. He was honored with the Ian McLellan Hunter Award for Lifetime Achievement by the Writers Guild of America (1999). Actors who have regularly worked with Sayles include Maggie Renzi, David Strathairn, Joe Morton, Chris Cooper, Mary McDonnell, Vincent Spano, Kevin Tighe, Josh Mostel, Tom Wright, Gordon Clapp and Angela Bassett. ^ Richard Corliss (October 1, 1984). "Blues for Black Actors". Time. Retrieved August 13, 2010. ^ Johnson, Mary; Neff, Renfreu; Mercurio, Jim; Goldsmith, David F. (April 15, 2016). "John Sayles on Screenwriting". Creative Screenwriting. Retrieved October 2, 2017. ^ "BIOGRAPHY OF JOHN SAYLES". johnsayles.com. Archived from the original on July 13, 2011. Retrieved August 13, 2010. ^ a b "NAACP | List of NAACP Image Awards Winners". NAACP. February 14, 2008. Retrieved November 27, 2018. ^ "2007 Archives - National Board of Review". National Board of Review. Retrieved November 27, 2018. ^ "San Sebastian Film Festival". sansebastianfestival. Retrieved November 27, 2018. ^ "2002 FFCC Award Winners". Florida Film Critics Circle. Retrieved November 27, 2018. ^ "2002 Archives - National Board of Review". National Board of Review. Retrieved November 27, 2018. ^ "Golden Space Needle History 1990-1999". www.siff.net. Retrieved November 27, 2018. ^ "1999 Archives - National Board of Review". National Board of Review. Retrieved November 27, 2018. ^ "Winners Nominations · BIFA · British Independent Film Awards". BIFA · British Independent Film Awards. October 24, 1998. Retrieved November 27, 2018. ^ "Winners & Nominees 1999". www.goldenglobes.com. Retrieved November 27, 2018. ^ a b c "Previous Awards – Political Film Society". polfilms.com. Retrieved November 27, 2018. ^ "The 69th Academy Awards | 1997". Oscars.org | Academy of Motion Picture Arts and Sciences. Retrieved November 27, 2018. ^ "1997 Film Original Screenplay | BAFTA Awards". awards.bafta.org. Retrieved November 27, 2018. ^ "The 65th Academy Awards | 1993". Oscars.org | Academy of Motion Picture Arts and Sciences. Retrieved November 27, 2018. ^ Ryan, Jack (1998). 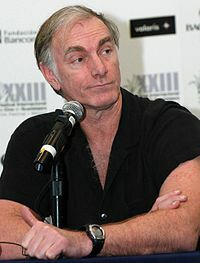 John Sayles, Filmmaker: A Critical Study of the Independent Writer-director : with a Filmography and a Bibliography. McFarland. ISBN 9780786405299.